The water has a higher melting point , boiling point , and heat of vaporization than most common liquid . This fact indicates that there are strong forces of attraction between the adjacent water molecules . 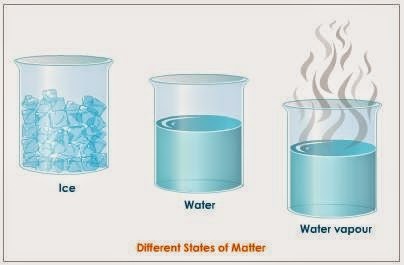 The states of the water are the solid state ( ice ) , the liquid state ( the water ) , and the gaseous state ( the water vapour ) at the normal temperature . You notice that the water is a good polar solvent . So , It has a great ability to dissolve the most ionic compounds such as the table salt ( sodium chloride ) . The water can also dissolve some covalent compounds such as the sugar that can form the hydrogen bonds with it . Some covalent compounds such as oil can not dissolve in the water as they can not form the hydrogen bonds with the water . The water is a good polar solvent . The high boiling point and the low freezing point of the water is due to the presence of the hydrogen bonds between its molecules . The density of the water in the solid state ( the ice ) is lower than its density in the liquid state as when the temperature of the water deceases than 4 degrees Celsius . The water molecules are collected together by the hydrogen bonds to form the ice crystals which have the hexagonal shape , the large volume and the large number of spaces between them . The ice crystals float on the water surface and this helps in the preservation of the life of the aquatic creatures in it . The water has high latent heat . So , it resists the change from a state to another . So , the water is used to extinguish the fires , as it consumes a large amount of the heat of the combustion media during its vaporization process . You notice that the temperature of the human body does not change by changing the atmospheric temperature . The high specific heat of the water makes it absorb or lose the large amount of the heat without changing its temperature . The water ionizes to give positive hydrogen ions and negative hydroxide ions . 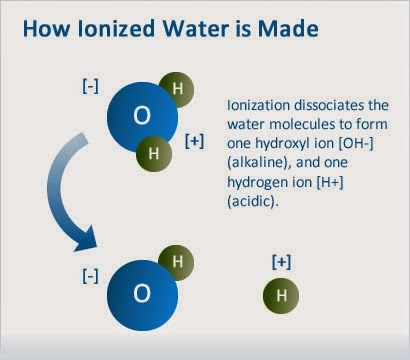 The ionization is the process of converting the molecules of some covalent compounds into ions , And The pure water is considered from the weakly ionized that gives positive hydrogen ions and negative hydroxide ions . The water has a neutral effect on the litmus paper as when it ionized , it gives equal numbers of the positive hydrogen ions ( which are responsible for the acidic property ) , and the negative ions ( which are responsible for the basic property ) . The water does not decompose into its elements ( hydrogen and oxygen ) under the normal conditions or even by the effect of the heat that helps to keep the aqueous solutions inside the cells of the living organisms .